Anna Karenin provides a vast panorama of contemporary life in Russia and of humanity in general. In it Tolstoy uses his intense imaginative insight to create some of the most memorable characters in literature. 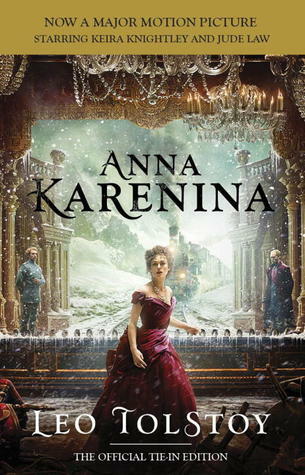 Anna is a sophisticated woman who abandons her empty existence as the wife of Karenin and turns to Count Vronsky to fulfil her passionate nature - with tragic consequences. Levin is a reflection of Tolstoy himself, often expressing the author's own views and convictions. Well everyone, I finally finished this beast of a book. It took me over a month to complete this beast. Almost two months. Holy cannoli for sure. Yes, I will be the first to admit I did a lot of skimming. Skimming to the point I felt I missed something vital and had to make a decision on whether or not to backtrack. I did 50% of the time. Other times I just shrugged and kept on my merry little way. This was too long. My version was 964 pages give or take. 964. Not the biggest book I have ever read, but still a big beast of a book with filler to make you forget the main plot of just a moment. I was honestly bored 80% of the book. There was only 20% of the book that I connect with and understood all those shimmering pages. The author is a good author. He writes real, deep truths. He just needs to calm down and get to the point a hair quicker. Yes, yes, it is an older book and writers back then were notorious for long-winded stories. However, he put them all to shame with this one. This a beloved book and I do not want anyone thinking the story itself is bad. The characters were indeed memorable and you can’t help but feel for them on a deep level. I hated Anna, but even when that certain moment happens that ya’ll know what I’m talking about happens, I couldn’t help but feel bad for her. Poor chit. I wish I could say I loved this book, but I didn’t. The story and characters are good. The writing isn’t bad for what it is, but my god it was long and tedious and an utter bore. Maybe I should’ve read the abridged version……………….. Even though I wanted things to speed up, this is a must-read book if you call yourself a book lover. The author really does build some interesting characters into a sad, lonely world where everyone is trying to find happiness. Some people find this happiness…some, well, do not. It is the way of the world. I’ll give this a 2. A 2 that you need to read. I would forgive you if you read the abridged version of the book.